There are no bookable seats available for this route at this time. 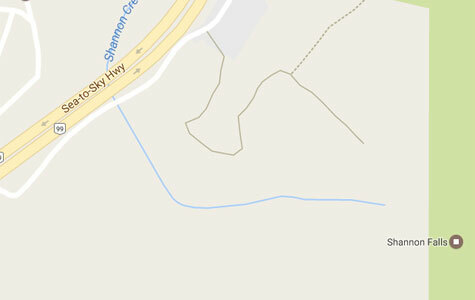 There are no upcoming scheduled trips to this location. Once available, they will be posted here and everyone will be notified. Subscribe for our newsletter below to be notified when more seats are added. Shannon Falls is composed of a series of cliffs, rising 335 metres above Highway 99, making it the third highest falls in the province. A popular day-use park, perfect for picnicking, hiking and access to the trail in Stawamus Chief Provincial Park. Important: this is NOT a guided trip. Only transportation is included. One of the most popular stops along the Sea to Sky Corridor, Shannon Falls Provincial Park is a must-see! From it’s family-friendly picnic area (near the bus drop-off), it is just a short five minute walk through the beautiful forest to get up close to the viewpoint of Shannon Falls, the third highest waterfall in British Columbia, rising over 335 metres! For those who are feeling a little more adventurous, you can tackle the Upper Shannon Falls trail. Caution: although the distance to the summit is only 3.5km, it is a strenuous long hike that is constantly uphill as you gain 450m (1476 ft) in that short distance, taking at least 4-6 hours roundtrip. To access this trail, continue from the Shannon Falls viewpoint to the Stawamus Chief trail, about 15 minutes further up the trail. Once you connect onto this trail, follow the signs directing you to the Upper Shannon Falls trail which winds through beautiful forests and streams, until you reach the top of Shannon Falls which greets you with views of Squamish and the Howe Sound below. Warning: never enter the water or get close to the water / falls - there is a grave risk of injury and death if you do so. After viewing the falls, a short trail connects you to Stawamus Chief Provincial Park. This will connect you to the most popular trail in the area of Stawamus Chief, known locally as “The Chief”. Standing over 702 metres (2303 ft) above Squamish, it is one of North America's largest granite monoliths. It conveniently stems off from the same trail as Upper Shannon Falls and offers three peaks to summit. Please allow yourself enough time and evaluate your own hiking skills: hiking the Chief is a challenge and has chains and ladders on the more technical parts of the trail. At the beginning of the hike, you will come across a long series of very steep stairs that will get your heart pumping. From there, follow the brightly coloured markers for the rest of your journey. First Peak is a 4km roundtrip climb from the start of the Stawamus Chief trail and can take an average hiker around 3-4 hours. Second Peak is 5km roundtrip and takes 4-5 hours, and Third Peak is 7km roundtrip and takes around 6-7 hours. At the end of your workout, you will be rewarded with a stunning bird’s eye view of the Howe Sound; no wonder this is on our to-do list in BC! Once you are dropped off at the park, you are responsible for your own safety. There are no guides - this is NOT a group or guided trip, as Parkbus only provides transportation. Make sure you review basic safety information, and bring food and lots of water (it is not possible to buy food or water in the park). There is limited cellphone reception in the park or in the parking lot. As is elsewhere in BC backcountry, you may encounter natural hazards, such as snowy conditions, poor visibility, wildlife as well as steep and dangerous cliffs, especially if you wander off trail (do not!). The bus will drop you off at the parking lot and trailhead for Shannon Falls. 3.2km connector trail will lead you to famous Stawamus Chief Provincial Park. 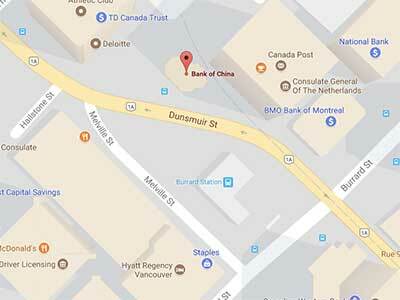 Our buses stop outside Bank of China, near Burrard Skytrain Station, at 1025 Dunsmuir Street! Can I walk from Shannon Falls to Stawamus Chief Provincial park? Yes, a couple of trails connect our Shannon Falls drop off to Stawamus Chief campground, trailheads and parking lot. The trial is about 3.2km long (6.4km return). If you are going to Stawamus Chief, please take that into consideration to make sure you do not miss the bus on the way back. Are there hiking trails accessible from Shannon Falls? There is an easy 350 metre long walking trail through a forest of Western hemlock, Douglas fir and Western red cedar along Shannon Creek which leads to the viewpoint. This viewpoint affords a spectacular view of the roaring falls. There is also a connecting trail between Shannon Falls and Stawamus Chief Provincial Park, which offers access to all the Chief summit hikes. Can I get to the Sea to Sky Gondola from Shannon Falls? Yes, there is a Connector Trail between Shannon Falls and the Gondola parking lot. If you are planning to take the gondola up and access any of the backcountry hikes from there, please make sure to keep track of your time to not miss the bus on the return. Is there a picnic area? Yes, there is a large designated picnic area equipped with BBQ holders and tables. If you are a large group interested in this space, you’ll need to make a reservation. For more information on making a reservation click here . Can I go climbing and bouldering at Stawamus Chief? The Chief is a world renowned climbing and bouldering destination, so there are definitely plenty of climbing opportunities available here - both for bouldering and multi-pitch climbing. All activities are to be undertaken on your own risk, as there are no guides or equipment rentals, and we only provide transportation. Plan your day accordingly to make sure you don’t miss the return bus. What hikes should I go on in Stawamus Chief? For your own safety and the preservation of the park, obey posted signs and keep to designated trails. Shortcutting trails destroys plant life and soil structure. To access Chief trailhead, you must first walk about 3.2km from the drop-off at Shannon Falls Provincial Park. Hiking trails are accessed from the day-use parking near the campground. They follow Oleson Creek before dividing into separate trails to each peak. Be properly prepared for a strenuous hike and changing weather. First Peak: 1.5-kilometre trail with an elevation gain of 540 metres. To Shannon Falls: 1.5-kilometre hike from the Stawamus Parking Lot. For trail maps and more information on Stawamus Chief Provincial Park please visit BC Parks website. Is there a place to buy food or water? No, all visitors must bring their own water and food for the day, especially if you are planning to go on any of the strenuous hikes starting here. Yes, bears can be encountered throughout summer months and it is very important to educate yourself with bear safety when visiting these wild places. For more information on bear safety click here .